Terrapin – Skimmer - SOS Safety International Inc. 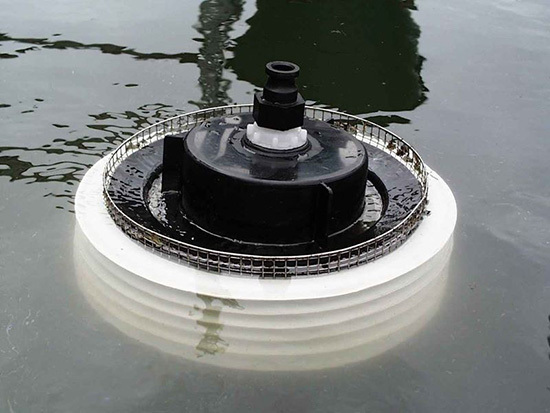 The TERRAPIN is a self-adjusting weir skimmer ideal for installation and deployment in tanks, industrial separators, wells and sumps where floating oil and other floating liquids need to be recovered. At the heart of the TERRAPIN is the self-adjusting weir that automatically sets the depth of the weir according to the pumping rate. Pump faster and the weir will sink lower and take a deeper cut. Pump slower and the weir will rise up and take a finer cut. The TERRAPIN has been designed with industrial applications in mind. 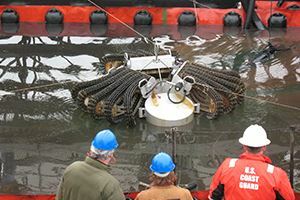 The unit may be used free floating with a 1¼” suction hose connected to the underside. 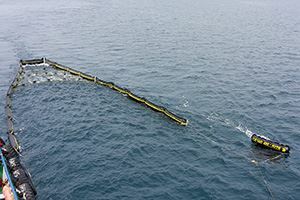 Alternatively a suction hose, connected to the top of the skimmer, can suspend the TERRAPIN. The diameter of the TERRAPIN is only 410 mm, which permits access into drains and through manholes in storage tanks. 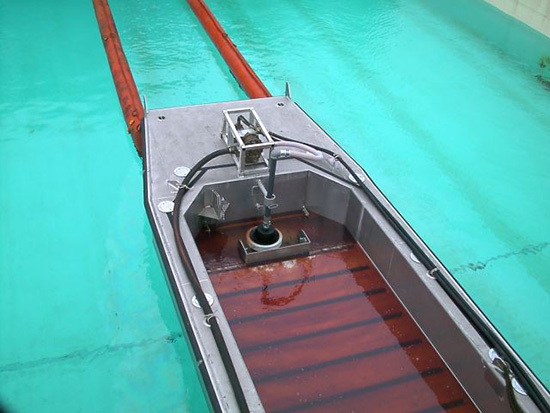 This skimmer may be considered for hazardous areas. 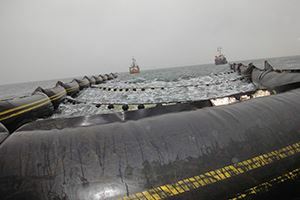 The TERRAPIN is constructed in marine grade stainless steel, moulded polyethylene and polyurethane – making it resistant to oils and many environments found in industrial applications. We can supply a variety of pumps to suit your application including air operated diaphragm, electric impeller and centrifugal. The TERRAPIN has a bottom connection for tanks and larger bodies of water. Using the top connection the TERRAPIN can be lowered into sumps, drains and tanks. 44 US Gallons per minute. 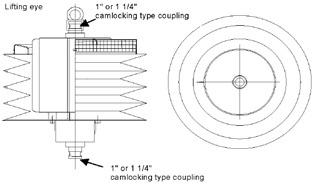 Connections: 1¼ in male Camlock type coupling. – chemical and acid resistant. 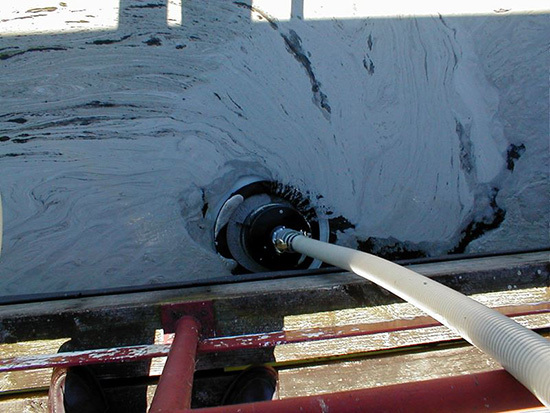 Suitable pumps: Pumps should be ideally self-priming suction type such as diaphragm, peristaltic etc with variable flow. The TERRAPIN may also be used with vacuum trucks. Hose: Suction hose with floats available on request. At slower suction rates the weir will be in a higher position providing finer skimming of the surface. Using the top connection the TERRAPIN can be lowered into sumps, drains and tanks.